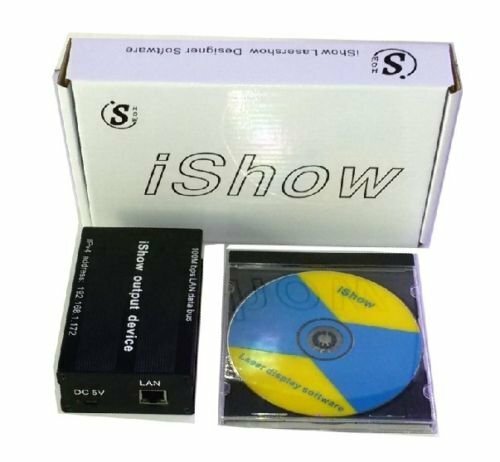 iShow V3.0 Ethernet Stage Laser Light Software 64 bit and USB To ILDA Box The iShow Laser Show software controller simply plugs in to your computer USB port and laser projector ILDA port. Simply run the software from your computer and control the laser creating graphics, beams and text shows. iShow is perfect for beginners and low budget systems. Watch our the iShow in action via the video below To upgrade to a fully professional laser software controller see our Quickshow listing. Below are some screen shots of the various iShow menu items. iShow Picture Editor iShow Quick Play window iShow Main Menu What you get: Software: iShow software download link. Note: As a number of CDs arrived damaged or had data missing, we are offereing a download link only to get the software to avoid any of these problems. Hardware: iShow USB interface box (110x78x31mm) USB cable to connect the box to your PC. Note: The ILDA cable to connect between the iShow dongle and laser projector is not included, but is available seperately as we have a range from 1m to 30m to suite all applications. See listings. Features: · Drawing lines and shapes · Positioning, size, edit, · Colour settings · zoom, rotate, mirror, copy · Colour chase, rainbow effect · Line blanking · Text, font list, width, height, fine/course settings · Preview · Play/ edit sequence · Add, delete, save, copy frame Projector requirements Installation: - Download the software from this listing and open the files - Click on iShowII_EN and then setup.exe - Follow the setup wizard instructions - When this is finished connect the interface box to your PC and install drivers - Your now set and ready to go enjoy.